Meteors that are large enough to survive the trip through the Earth’s atmosphere are usually completely destroyed during impact. Those meteorites that hit on land leave behind an impact crater. On Earth, wind, water, and vegetation rapidly (on geologic times scales) erase craters. With few exceptions, even the largest craters are eventually destroyed by the processes of plate tectonics. On the Moon, however, craters are virtually permanent. The only weathering is caused by later impacts and the solar wind. 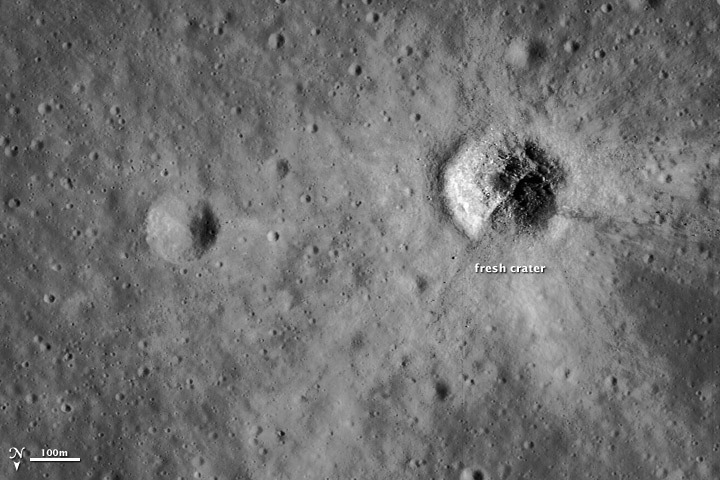 A “fresh” crater on the Moon can be hundreds of millions of years old. These images compare recent impact craters on the Moon (top) and Earth (below). 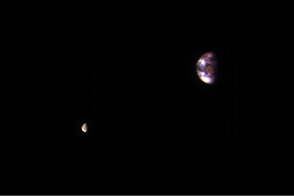 Each has a resolution of 2 meters per pixel, and illumination is from the right. The bright “rays” surrounding the lunar crater show that the impact was relatively recent—less than 500 million years ago. Fresh material (ejected by the impact) on the lunar surface is initially bright, and it darkens over time. Boulders formed from compressed lunar dust and soil litter the crater floor. 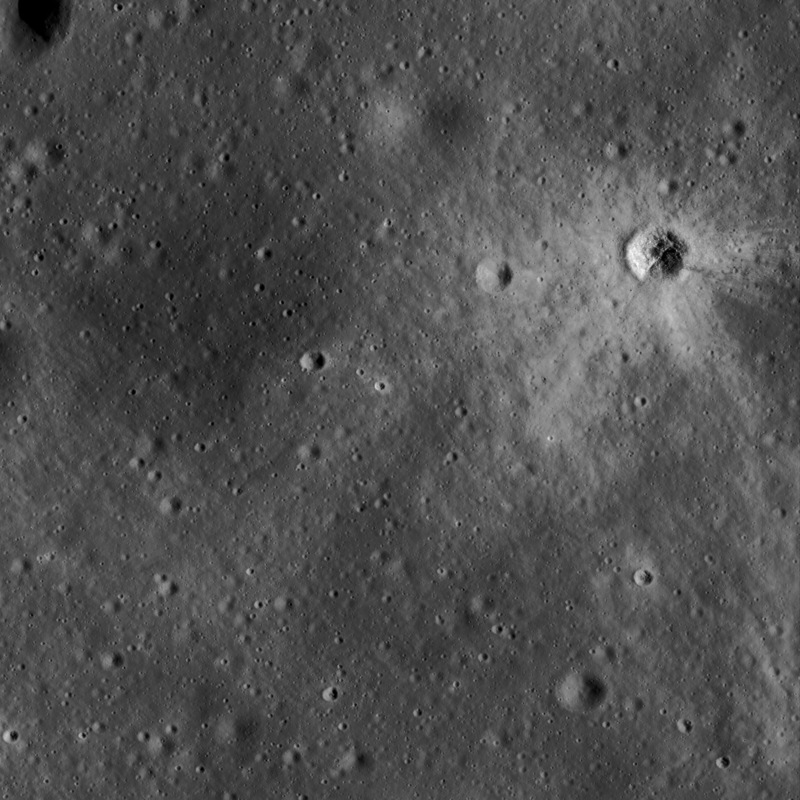 This relatively young crater is on the far side of the Moon south of Tsander Crater; the image is one of the first acquired by NASA’s Lunar Reconnaissance Orbiter Camera (LROC). 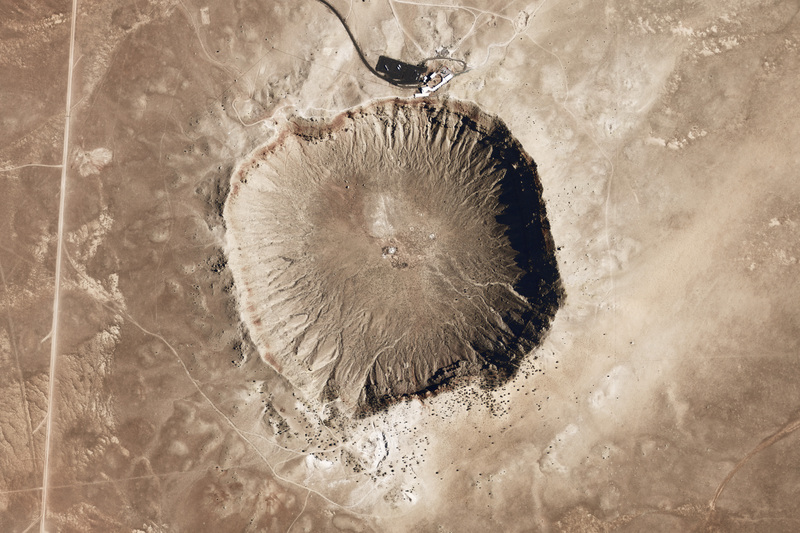 In contrast, Meteor Crater (also known as Barringer Crater) on Earth is only 50,000 years old. Even so, it’s unusually well preserved in the arid climate of the Colorado Plateau. Meteor Crater formed from the impact of an iron-nickel asteroid about 46 meters (150 feet) across. Most of the asteroid melted or vaporized on impact. The collision initially formed a crater over 1,200 meters (4,000) feet across and 210 meters (700 feet) deep. Subsequent erosion has partially filled the crater, which is now only 150 meters (550 feet) deep. Layers of exposed limestone and sandstone are visible just beneath the crater rim, as are large stone blocks excavated by the impact. 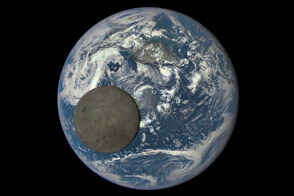 Impacts have shaped the Earth and Moon since early in the history of the solar system. In fact, the Moon likely formed when a proto-planet (likely the size of Mars) crashed into the Earth over 4.5 billion years ago. The collision sprayed material from the two worlds into orbit around the Earth. The debris coalesced and formed the Moon. Meteorites continue to strike both the Earth and Moon. Micrometeorites bombard the Earth continuously. Larger asteroids hit Earth less frequently. Asteroids measuring roughly 50 meters (160 feet) across strike the Earth every 1,000–2,000 years, while more than 100,000 years typically elapse between strikes from asteroids larger than 1,000 meters (3,300 feet) across. Lunar image courtesy Lunar Reconnaissance Orbiter Camera. 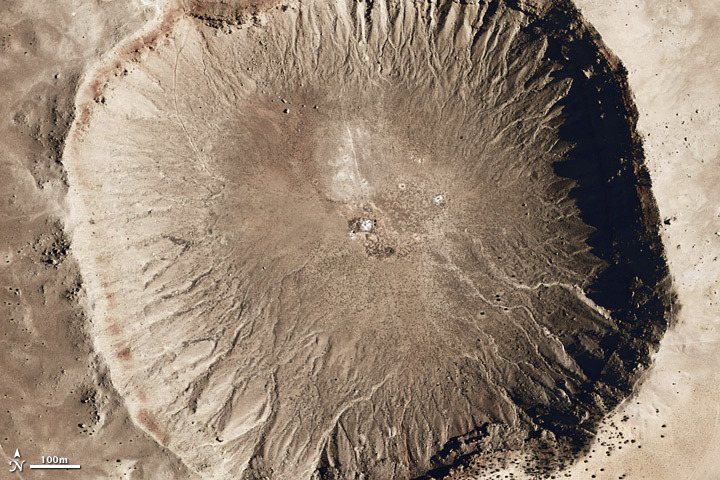 Meteor Crater image courtesy the National Map Seamless Server. Caption by Robert Simmon. Throughout their histories, both the Moon and Earth have been bombarded by meteorites and asteroids, which often leave behind dramatic impact craters.